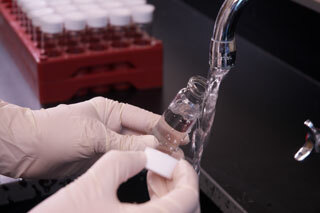 Water tests are used to evaluate microbial content and chemical purity of water samples. Because water is a significant environmental component, microbial control is a requirement of all Good Manufacturing Practices. Tests can be performed on source water, process water, purified water, deionized water, and highly purified water. Routine monitoring of the water system is also recommended to ensure ongoing compliance with the manufacturer’s acceptance criteria and bioburden monitoring programs. Nelson Labs will customize water tests to meet the precise needs of the sponsor. Our Technical Consulting team can also assist in writing IQ/OQ/PQ protocols for initial water system qualifications and related validations, sampling plans, test frequency determination, and failure investigations. In water testing, water samples for microbial testing are filtered using a 0.45 micron filter membrane to capture microorganism. The membrane is then applied to an agar plate. After incubation, the colony-forming units are counted to give the organisms per milliliter. Analysis is generally performed by the test method described in the Standard Methods for Examination of Water and Wastewater, which indicates the use of membrane filtration and R2A agar. Depending on the type of water, plating may be performed on soybean casein digest agar or selective agar for fungal growth. The amount of sample filtered, incubation time, and temperature parameters are variable and must be defined by the sponsor prior to testing. These variables are determined by the type of water sample. For the analytical portion of the tests, conductivity, and TOC, the water is scanned using equipment to detect conductivity and TOC. The use of TOC is important as it is a highly sensitive, parts per billion (ppb), test method for gross screening of organic material in water typically indicative of organism presence in high counts. If you have additional questions about Water System Validation testing, or would like to consult with the experts at Nelson Labs, just send us a request or call us at +1 (801) 290-7500.